Location is everything! Tucked away at the end of a culdesac on a pie shaped lot! 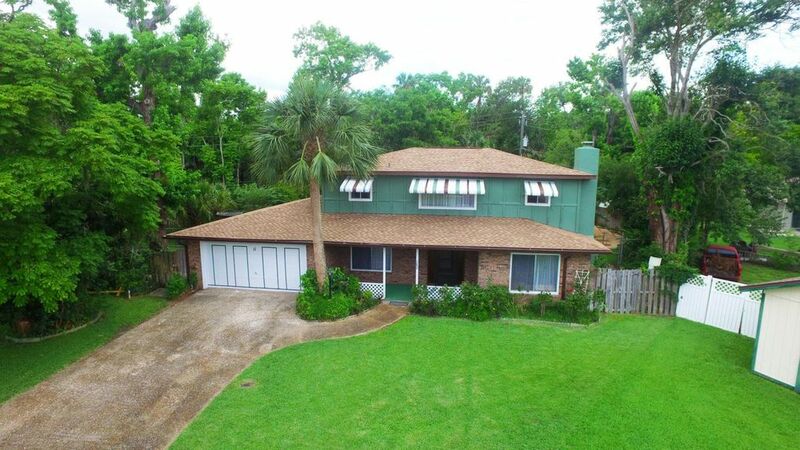 You will scream... ''Honey, there is a park in our back yard'' The fenced yard has a gate & path to one of the many ponds in Central Park in Ormond Beach! This 2-story home has a brand new 2017 roof! Also in 2017 she got a new kitchen including cabinets and counter tops! Tile flooring! New carpeting! Downstairs you have a formal living room, dining room, big eat-in kitchen, family room & 1/2 bath & mud room! From the welcoming front porch you enter in to the foyer with a curved wrought iron staircase to 3 generous sized bedrooms! The master has private bath & sliders to balcony overlooking pool! Big covered lania! Inground pool! Pool equipment shed! Fenced yard! Crossed fenced areas for pets!